Stem(s) slender, erect, 6-12 dm, usually branched above, usually glabrous or nearly so; stipules narrow, 2-4 mm, caducous; petioles mostly 1.5-5 cm; lfls thin, lanceolate or oblong, mostly 3-8 times as long as wide, glabrous or somewhat appressed-hairy, to 10 נ2.5 cm; infl large and branching, 1-4 dm; fls 6-8 mm, on pedicels 4-11 mm; cal 2.5-3.5 mm; stipe 2.5-3.5 mm; articles 3-6, ±triangular, 5-7.5 נ3.5-4.5 mm. Dry woods; s. Me. to s. Ont., Mich., and Neb., s. to Fla. and Tex. July, Aug. The broader-lvd forms grade into no. 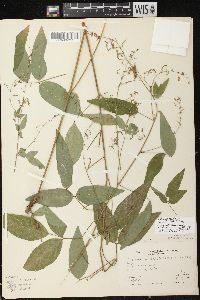 18 [Desmodium glabellum (Michx.) DC. ].